In a drama’s pilot, you expect a lot of setup — characters are introduced, motives are revealed, relationships are established, people are scalped, etc. If all goes well, enough track is laid for things to actually start happening in episode two. 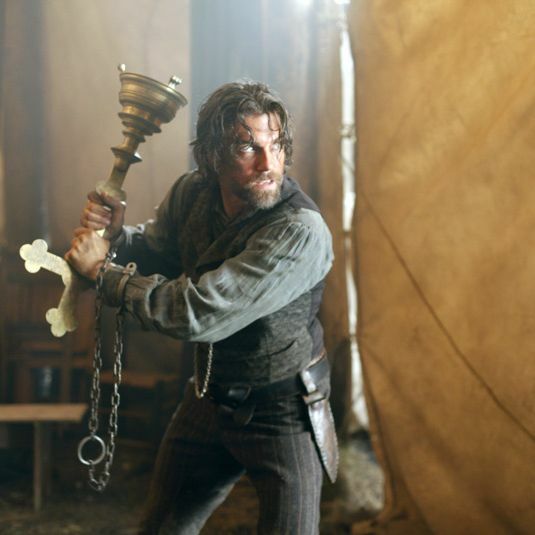 All didn’t go well for Not Deadwood, a show AMC insists on calling Hell on Wheels, because it spent the majority of its second episode swinging more hammers in an attempt to get to a place that’ll allow this train to finally get out of the station. We start with our comic-book villain and railroad tycoon Doc Durant, who’s out in that Nebraska field where bloodthirsty savages (aren’t they all) murdered a bunch of noble, well-meaning white folks (aren’t they all), including coughing bonerboy Robert Bell. A newspaper reporter is there photographing the bodies to show the white folks why it’s so important to tame these lands. But the scene’s not gruesome enough for Durant. So he does what anyone who tortured squirrels as a child would do and shoves a few arrows through a man’s rotting chest. How else would the paper’s readers know that it wasn’t just a strong wind that knocked them all down? Back in Hell on Wheels, it’s time to meet another character. He’s Durant’s lawman in this traveling circus of a town and he goes by The Swede (stay away Julie Taylor!). Played by creepy-faced Canadian actor Christopher Heyerdahl, The Swede, who’s Norwegian but doesn’t mind the misnomer, has a cartoonish voice that makes him sound like the Swedish Chef’s accountant older brother. As Durant’s head of security, he’s looking into the death of the camp’s old boss, Daniel Johnson, and thinks our bearded buddy Bohannaon is the man who slashed his throat. Even if he didn’t, though — and he didn’t — The Swede doesn’t much mind hanging a man who doesn’t offer much. “When harlots and dipsomaniacs are killed, I do not lose a minute’s sleep,” he says, barely suppressing a “Börk börk börk!” He takes Bohannaon to a train car set up as a jail, where the former Confederate soldier immediately transforms into Rebel MacGyver, yanking at nails in the floorboard in his attempt to escape. Back out in the plains, Lily, the horny blonde wife of dead Robert, is hiding behind a log as a group of Indians make s’mores 100 yards away. Joseph Black Moon, an Indian who’s no longer bloodthirsty now that he’s been baptized, materializes out of the woods. He asks, “Where is she?” in that way people ask questions on TV expecting others to know exactly to what they’re referring. The savages don’t have her, but as one yells out, “You better find her before I do.” Otherwise he’ll defile and scalp her like all Indians do to all white people. And that whole conversation between Indian dude in animal skin and Indian dude in a mortician’s suit? In English, naturally. Bohannaon is still working at those floorboards when Elam, the former slave played by Common, comes to see if he’s going to get ratted out for slicing old man Johnson’s throat. Elam says he knows Bohannaon is on a revenge murder spree and will spill it all if Bohannaon rats on him. Through his beard Bohannaon says, “You tell your story then I’ll tell mine. We’ll see who they believe.” It’s a bit of a throwaway moment. It’s obvious what he means, and since Bohannaon’s not going to squeal anyway, it doesn’t really matter. But then, just in case you don’t understand, Elam says, “Yeah, who would believe some ni–a slave over a white man.” YES, WE GOT THAT. This need to explain every little thing that might be shrouded in mystery, or in this case not shrouded at all, is carried over from the pilot and it’s starting to make me think AMC thinks we’re all idiots. We’re watching AMC, AMC. That means we’re not idiots … right? The Swede’s speech recalls Durant’s painful monologue from the pilot, but only because it was so much better. Just like The Swede is a far better villain than the blowhard Durant. He’s creepy and vindictive and delivers his most menacing lines with a slight grin. He’s the villain we want and he makes Durant look like a pot-bellied banker from a political cartoon. What I’m trying to say here is more Swede, please! Instead we get more Durant. He’s back in Nebraska dictating a story to the newspaperman about the savages murdering the honest white men. I’ll just leave this here. Meanwhile, Lily is out in the prairie having a lady Rambo moment, sewing a wound on her chest shut with a wooden needle. Over in Hell on Wheels, Rebel MacGyver has escaped his train car and enlisted Elam, who’s looking more and more like the Tubbs to his Crocket, to cut off his chains. (Whoa, black man removes white man’s chains. Heavy.) Once free, he’s back on the run from The Swede, who in true Western villain form is decked out in all black. Bohannaon hides in a train car, the same train car Durant enters when he finally arrives in Hell on Wheels. Despite that whole hanging thing, Bohannaon is there to apply for Johnson’s job. He feeds Durant some crap about why he should hire him that includes far more information than this revenge-crazed solider who’s been around for no more than two days should have. And because the show’s still in the process of setting up rivalries and not having its characters make logical decisions, Durant gives him the job as foreman of the whole operation. Apparently he was impressed with the size of Bohannaon’s balls. As Durant and Bohannaon go outside, The Swede runs at them ready to hang Rebel MacGyver from a rope. Durant stops him. “This is my new foreman,” he says, and The Swede isn’t happy. Bohannaon retreats to the boss tent, still filled with the old boss’s stuff, and finds right on top of the dead man’s things a piece of embroidery he saw his wife making in flashback earlier in the episode. Now that’s a tidy coincidence! So here we are two episodes in. Bohannaon is the boss of the camp and hated by its lawman. He’s got a black brother in beards who’s willing to help him out, and Blond Rambo should be arriving any day now. Oh, there are also a couple of Irish brothers who couldn’t be boring me any more with their stories of Boston and mom. Surely this is enough track to get this metaphorical train rolling, right?